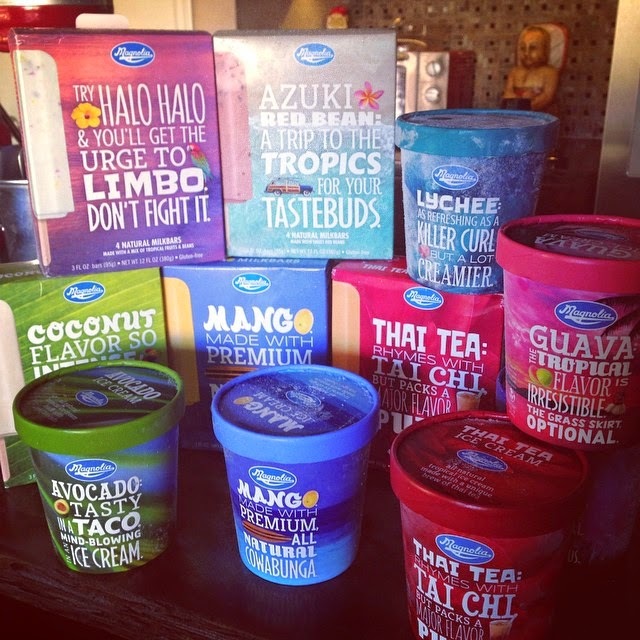 Healthy, Busy Mom: Magnolia Ice Cream Week: Oh How We Love Thee!!!! Magnolia Ice Cream Week: Oh How We Love Thee!!!! I don't think I've ever met anyone who DOESN'T like ice cream. If I have, I'm sure I looked at them as if they were from outer space and walked away. That's just crazy talk. So, the question is...what flavor is YOUR flavor? I've often heard that our lives are like our favorite flavors of ice cream. Are you vanilla? Rocky Road? Superman? Maybe you're some wacky, off-the-wall, fruity patooty flavor that no one has ever heard of...THAT'S ME! Many of the brands I love to write about aren't afraid to put a little expression and creativity into their product. I'd MUCH rather support a brand who throws caution to the wind and cares less about what the general public thinks. Brands that attract like minds are MY kind of people! Enter Magnolia Ice Cream...WHERE THE HELL HAVE YOU BEEN ALL MY LIFE ?!?!?!?!?! I was overwhelmed with gratitude and hunger when I got the sample package. I had no idea where to start...so I grabbed a spoon and my 5 year-old and we dug in! First of all, I'm a huge fan of tropical cultures, Asian cultures (especially you happy Filipino folks) and all the foods that come with them. You can even see my little kitchen Buddha in the background of the title photo at the top of this page. So, needless to say, Magnolia had me at the packaging, the titles and the language they used on their products. I was already in love before I even opened the containers. I went for the pints and the Thai Tea flavor first. I lived in San Diego for about 20 years, and one of my favorite places to visit was the local Asian grocery store, so I could get a Thai Tea with boba! The second this stuff hit my lips...I went straight home. All that was missing was the boba. It was perfectly creamy, super sweet and I got that tamarind and spice flavor just at the right moment. DELISH! My kiddo is VERY vanilla...so he went for the Lychee, which was the most vanilla LOOKING flavor. He took a bite and ran off with the container and a spoon. I haven't seen him since. I think he liked it. At this point, I knew the calories would start adding up, so I had to choose wisely. Avocado? I've made that flavor of ice cream before...I know its delicious. Mango? Done it. Lychee? Gone. But, there was ONE little beauty that hadn't yet caught my eye. 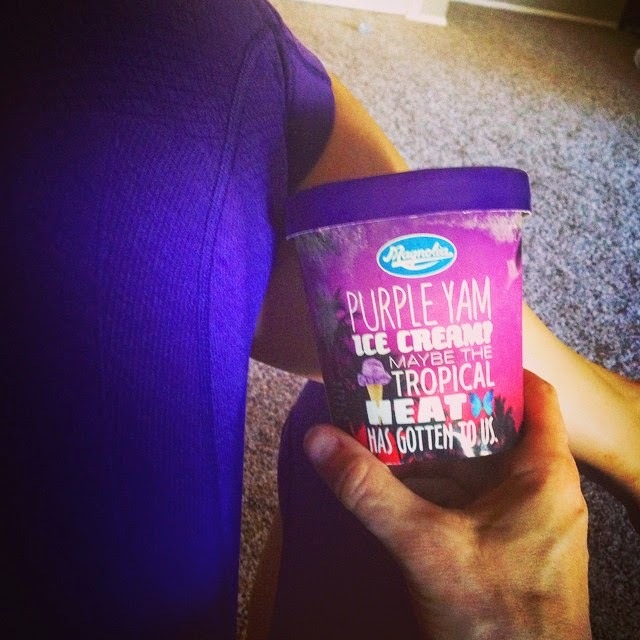 It was in a beautiful, purple color container that just HAPPENED to match my yoga pants that day. PURPLE YAM. What the heck was this? I thought to myself there was NO way I was going to like this. I pictured a gritty, potato starchy texture with a somewhat savory flavor that was attemptedly disguised with tons of sugar and who knows what else. But the spoon went in my mouth and I immediately thought ... "Birthday Cake!" It was THAT delicious. I'm doing my best to save some of this stuff to share a couple of recipes with you later this week. I'll give everyone some more details on Magnolia Ice Cream, tell you where you can buy it here in Phoenix and Scottsdale, give you some DIY birthday party ideas, slam some in between some delicious cookies, and yep...I'll make a milkshake with some boba. It has to be done. Magnolia...we are ALL singing your praises in this household. Oh yeah everyone...did I mention this stuff is ALL NATURAL...with REAL fresh fruit, delicious REAL milk and cream?! Yep. It's ALL good...and I haven't even started talking about the bars. man!! it has been so long that i drank any shakes because i love juices more than shakes because they are very heavy and juices are light and nice too. i want to drink one though.